February’s KRG meeting included a practical session, and was well attended. We were pleased to welcome two visitors who are working towards their Foundation licences. Some members were unable to attend due to prior commitments. John Bils brought along his impressive Marconi test set and we had a number of wideband RF preamps to test, along with a variety of cheap Chinese handhelds, mostly bought from eBay. All the preamps were naked PCB’s with SMA inputs and outputs, and all cost under a fiver. Despite meticulous preparations there was a vital cable missing, so it was not possible to measure SINAD to 10 decimal places. But, as the demonstration showed, a pair of uncalibrated ears was all that was required. Just listen for the transition between smooth and rough noise, when the “pop” rate is about 10 per second. That is a remarkably accurate point, which for most of the rigs occurred around 0.16uV PD input. The rig chosen for most of the tests was a Yaesu VX7 handheld, which had roughly similar sensitivity on VHF and UHF. It also had an S-meter, but it was stressed that you should never take any notice of S-meters when assessing preamps. Instead, consider “does this preamp improve the intelligibility of very weak signals. If the answer is no, don’t use it. It was stressed that preamps, especially wideband ones, can overload the receiver with large signals which mix together to form a whole spectrum of unwanted intermodulation products. So they should never be used unless absolutely necessary. S-meters rarely have any meaningful calibration at all, but if you stick a preamp in front of the rig, the s-meter is even more meaningless. “OK Jim, you are 5 and 9+20, but not killing the noise”. How daft is that? The first preamp tested was claimed to have a range of 50-4000MHz with a 0.6db noise figure. There was no mention of gain, which is actually a good sign. If they emphasise the gain, but fail to mention the noise figure, they are either pulling a fast one or they don’t understand the product. The lower the noise figure, the better the preamp, and sub-1dB NF is easily acheivable these days. Without a noise figure meter, the NF couldn’t be verified. But as the VX7 receiver is very good already, it requires a very good preamp to make any noticeable improvement. 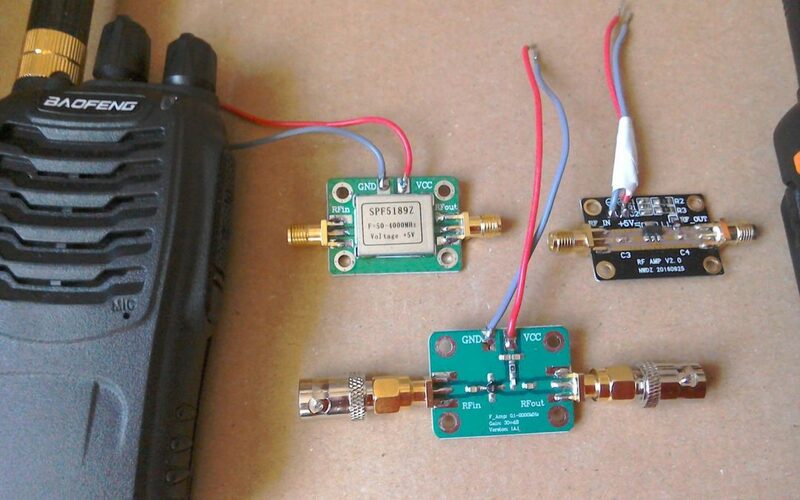 The first preamp did indeed improve the sensitivity on both VHF and UHF. The second preamp, marked SP5189z on the screening cover covered the same frequency range and was equally good. Like the first it is meant to be powered from 5 volts. A 5v lithium “Power Bank” was used for the purpose. The 3rd, and cheapest, preamp claimed over 30db gain. This was a bad sign. Anything over 10-15db is too much gain, unless you are using it to drive a very long piece of coax. To be fair, that’s what some of these devices were intended for – distribution amplifiers. There was no mention of noise figure, so this amp was not expected to perform well. In fact, when first connected, it proved to be a brilliant attenuator! The signal disappeared, and the signal generator had to be cranked up to 10 microvolts to get it back. Unlike the previous amps, the supply pin was marked “VCC” instead of 5 volts, but there was no indication what the max voltage was. So the 5v supply was replaced by 12 volts and we waited for the magic smoke to be released. There was no smoke, and the amplifier now gave a credible performance, although it did slightly degrade the VX7 sensitivity from 0.163 to 0.19 uV, meaning this amp has a worse noise figure than the VX7. However, when the VX7’s attenuator was turned on, simulating a “deaf” rig or a lot of feeder loss, it showed how even a bad preamp could improve the system performance. Judging by the combination of gain, noise figure and power dissipation, it is likely that this device is optimised for strong signal handling. It might therefore make a good candidate for a masthead or distribution amplifier, for example sharing one antenna between several wideband receivers via a resistive splitter. How about mounting it inside a “Flowerpot”-style antenna, feeding the DC up the coax? For a couple of quid it’s worth a try! It was interesting that most of the handhelds tested had remarkably similar sensitivity, with the exception of the two Baofeng UV-5R types which came out around 0.14uV. That doesn’t seem much of a difference, but the 0.16uV signal that was slightly rough on most of the rigs sounded smooth on the UV-5R. We would like to thank John for bringing his equipment, and all those who turned up to make it worth his while. And we wish our visitors good luck with their Foundation Licence studies!